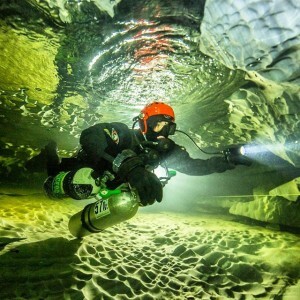 Despite uncooperative weather, cave divers exploring have added an additional 382 meters (1253 feet) to the length of the longest underwater cave in Sweden. The team of 18 people, including 15 cave divers, gathered last week in Sweden’s Bjurälven Nature Reserve in the Jämtland mountains in northern Sweden for the 2015 Bjurälven Expedition. The divers, a hand-picked team from the Swedish Speleology Association, were following the Bjurälven river which disappears underground into Dolinsjö cave, before reappearing about three kilometers (1.86 miles) away. Although the winter weather isn’t ideal for diving, the expeditions, which began in 2007, are only attempted in the winter due to a strong summer rate of flow that make diving impossible. This year, the team focused on the third sump—there are two dry sections of cave which require the divers to get out of the water—where they encountered larger passages with a strong flow which indicates a more active part of the cave. In one of these dry sections, they unexpectedly came across a small frog. Besides exploration, the team continued its work pinpointing locations on the surface with radio transmitters and began a new project filming the cave system with 3D software. In addition, there was also a team of 5 climbers on the trip who explored the entrance cave that is not water filled. For their continued efforts, the cave has now been pushed to 1,782 meters (1.1 miles) long.